Mr. Samsu picks up the largest brush from the basket and thinks for a while. This may well be the last painting he ever does. He does not need to draw anything from before. He has enough expertise and experience. Sixty years worth of it. So without wasting another moment he dabs the brush into a can of Rumana colors – the brilliant shade of red, it has always been his favorite. From the time he first laid eyes on the 10 inch vacant steel plate, he knew what he would paint. By using his shaky, yet mastered hands, he would bring to life his dream girl – Bobita. He intricately paints her face with the many hues of blue, yellow, green and pink and borders her facial structures with a bold black. The light from the only window illuminates the canvas and he himself becomes impressed by his creation of dangerous vibrant colors. It was his contribution to this world. His contribution to people’s art. 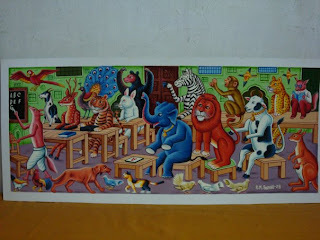 We are all familiar with Pablo Picasso, Edvard Munch, Vincent Van Gogh, Paul Cezanne (at least some of you must be. Otherwise, where is this world headed? )But are you familiar with S.M. Samsu or the many more like him? The rickshaw paintings we see everyday are so common to us locals, that we don’t appreciate it to the fullest. But we’ve always been observers. How do you think the painters feel? By talking to Mr.Samsu and other rickshaw painters, we learn to understand what art feels like to them. 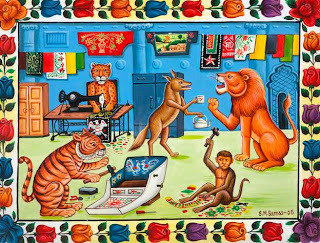 They are like any other world-class painter: they make a living with their passion, support their families and try their best to provide education for their children. They are inspired by the energy of the surrounding and they successfully create that energy with the bold colors that they use. They paint and draw without primary education, or any kind of education for that matter, because from the distant time of their childhood, they’ve learnt to observe and absorb the scenery around them. And the things that inspire them are the ones that they paint. Why don’t we see its worth? A common Answer could be that there are so much of such paintings that people think that making them is simple and ordinary. If that’s what you think, then try painting one yourself. Chances are, you’ll miss the mark by a long way. 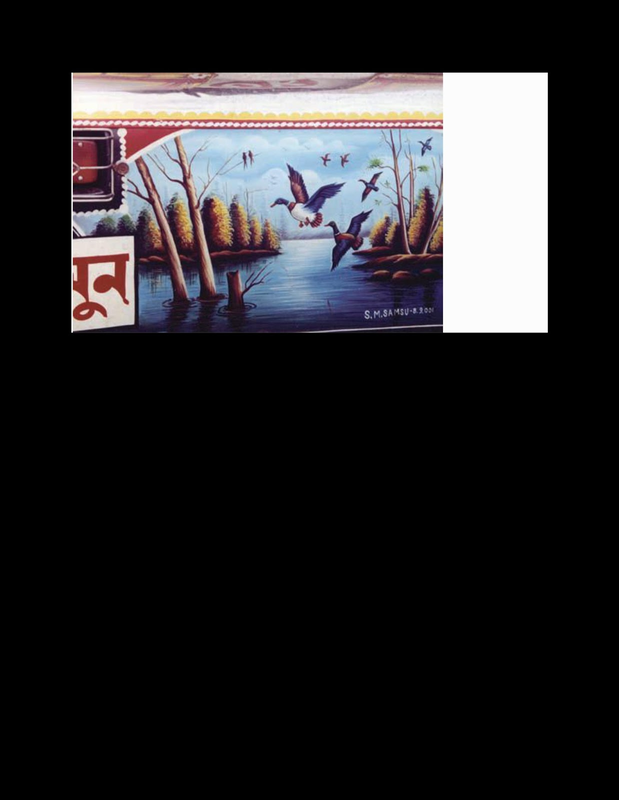 Like any other paintings, abstract or not, rickshaw paintings inspire us. Have you ever noticed the colors that they use? 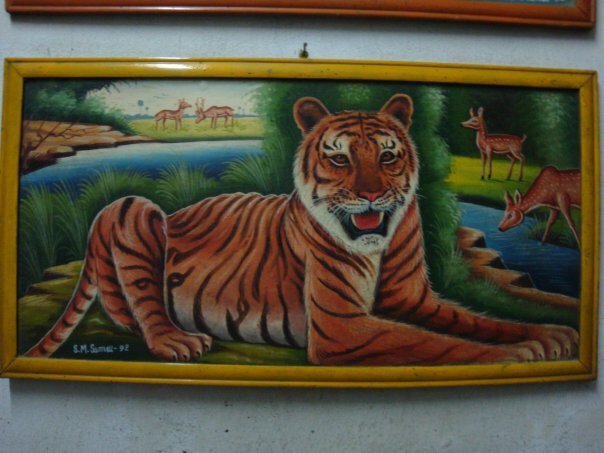 They make the plates of the rickshaws stand out. Hence, they are bold and we notice them more than we would have if they were painted with light colors. The simplicity of their work disguises the complexity and inner messages they may contain. The paintings are the painters’ podiums where they can say whatever they feel. 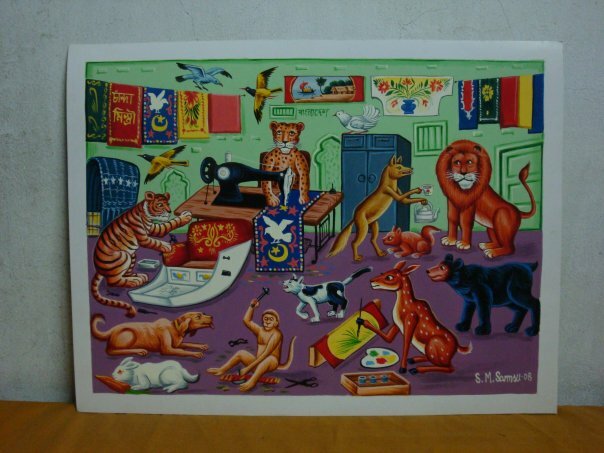 The paintings can be decoded in various ways. But to do so we must observe them with open minds. We must cherish their existence, because without them the streets of our cities would be a whole lot more bland. Creative and artistic designs were used in wooden doors, rectilinear door frames, rectangular and vertical patterns, windows, home decoration, furniture and more. 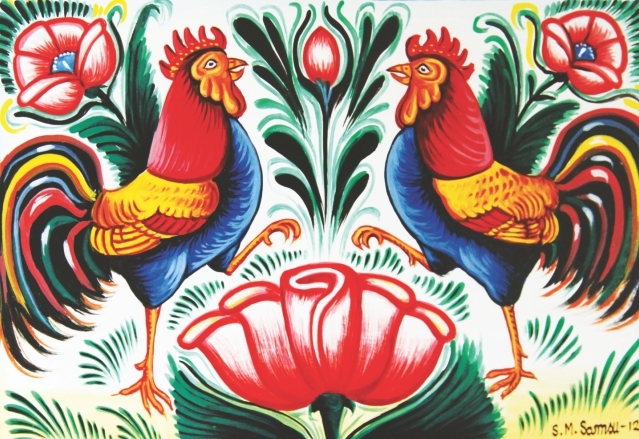 Birds, animal forms, foliage and different parts of nature were used on the timber in the past. The tradition had been on the wane for some time and by now it has become quite hard to find the existence of such craftsmen. It is widely known that woodcarving is a time consuming and labour intensive work. 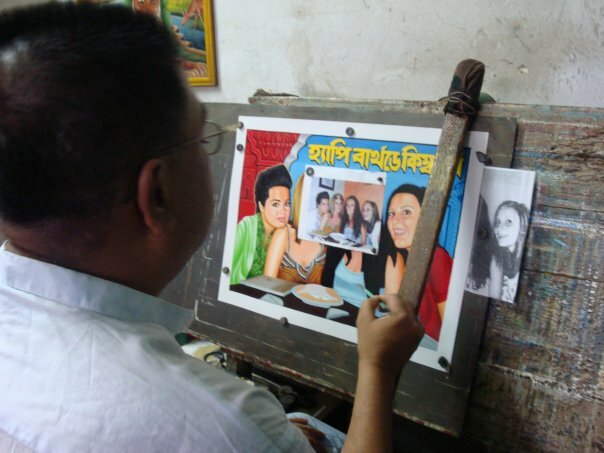 The medium has been practised in the Craft Department of Faculty of Fine Arts, University of Dhaka. But the genre of art did not acquire the spirit it was expected to. Fortunately, a few enthusiastic artists are now trying to rejuvenate the medium. ABM Rokon-Uz-Zaman Sohel is one of them. 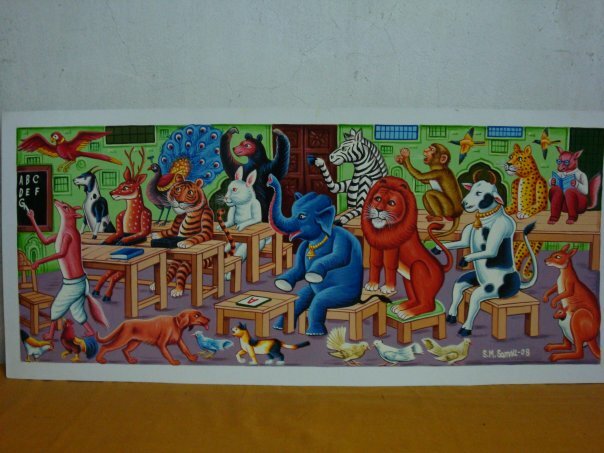 He graduated from the Faculty of Fine Arts, University of Dhaka. He has learned many delicate methods and techniques of woodcarving from some of his dedicated teachers like Abdus Shakoor Shah and Faruk Ahmmed Mollah. 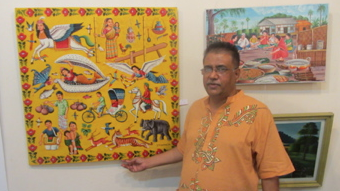 Sohel's solo art exhibition titled "Journey by Rickshaw" is now on at Zainul Gallery, Faculty of Fine Arts (FFA), University of Dhaka. The exhibition was inaugurated on October 4. Professor Shahid Akhter Hossain, Pro Vice Chancellor of Dhaka University was present as chief guest. Professor Matlub Ali, Dean of FFA, presided over the programme. Professor Abdus Shakoor Shah, former chairman, Department of Crafts, FFA; Nazib Mohammad, associate professor and Faruk Ahmmed Mollah, assistant professor of the Crafts Department, among others, were present at the inaugural session. 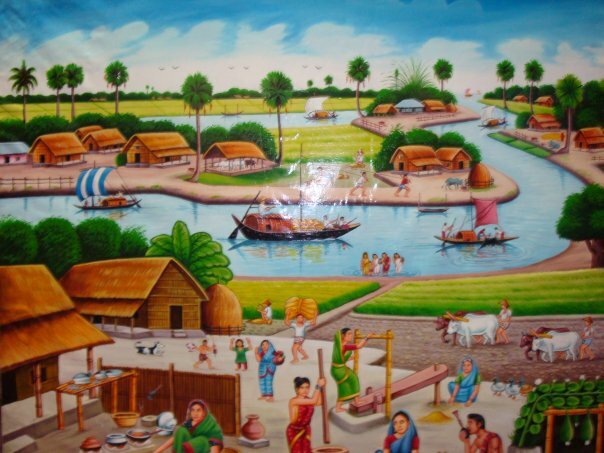 It is significant that there was no strong theme in customary woodcarving before in our country. 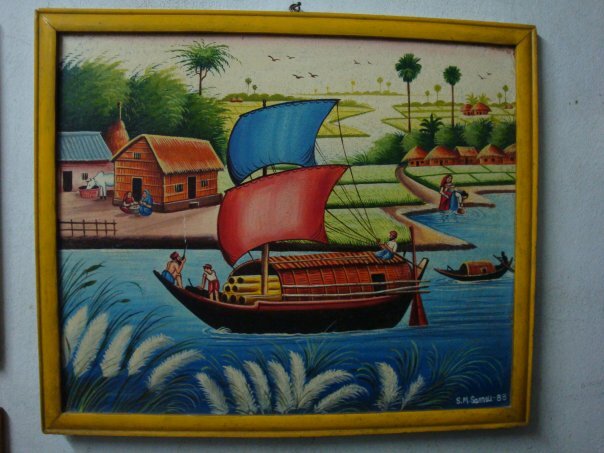 Since the '90s, the panoramic beauty of rural Bengal and young couples became significantly noticeable in woodcarving. The woodcarvers raced to the contest of the painters, who work in two dimensions. Nowadays, woodcarvings have taken a prestigious place beside paintings. Woodcarvings also decorate doors and walls in a very artistic way. Art galleries and art shops have successfully made an impact on collectors' tastes with their collection of woodcarvings. 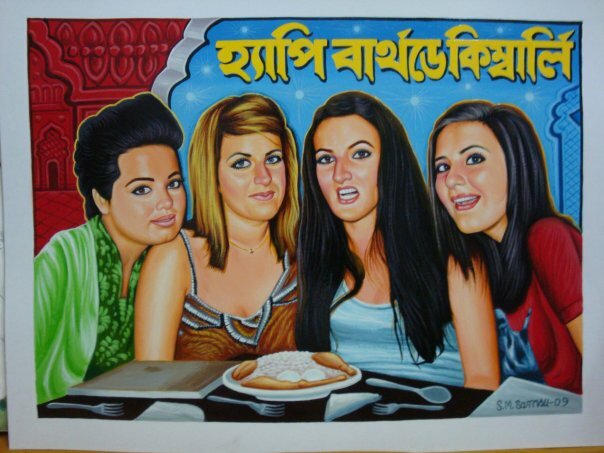 Against a background of such reality, Sohel has practiced this medium. His woodworks are a testimony to the fact that even after the trees have died, there is a possibility of the renewal of life. 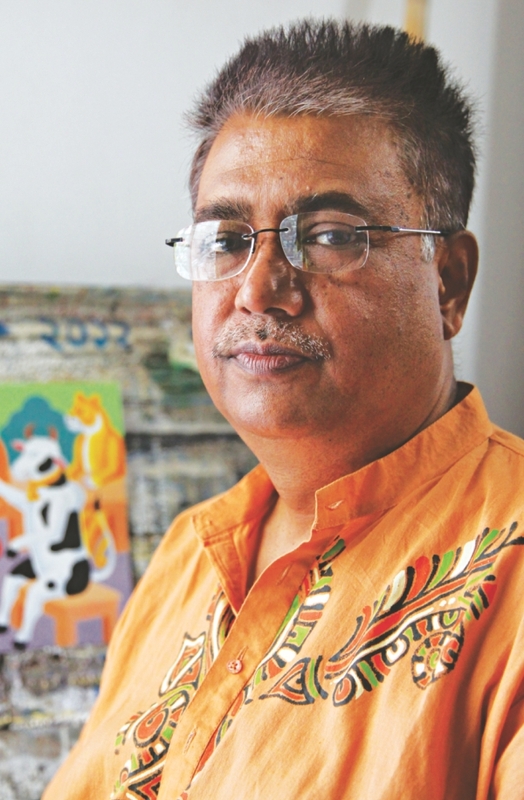 Sohel gives an artistic life to his creation. Observing trees, the artist easily comprehends how the branches can be used through his works. The texture of wood creates an eye-catching quality. 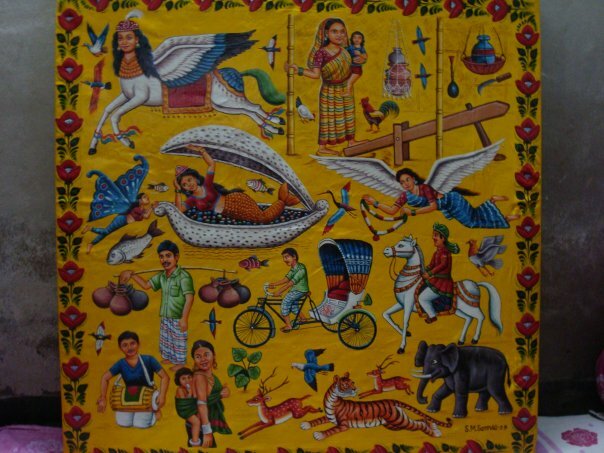 His works replete with semi-urban people, birds, beads, peacocks, blossoming flowers and foliage, speak of rural and pastoral Bengal. Human forms are often merged with urban and semi-urban setting. The artist has been trying to acquire skills in sketching. 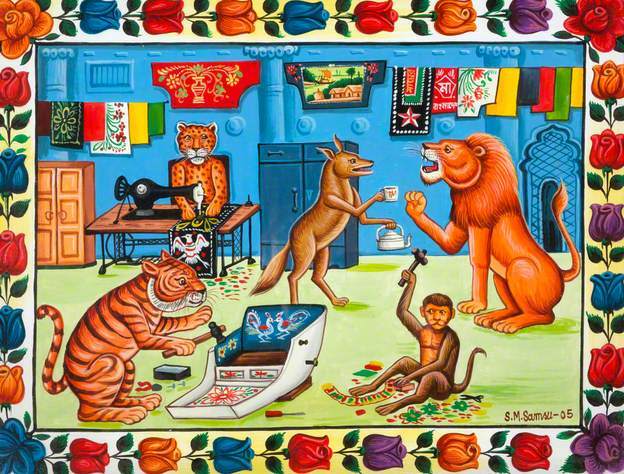 His colours and forms keep telling us about Bangladesh and its varied traditional aspects. 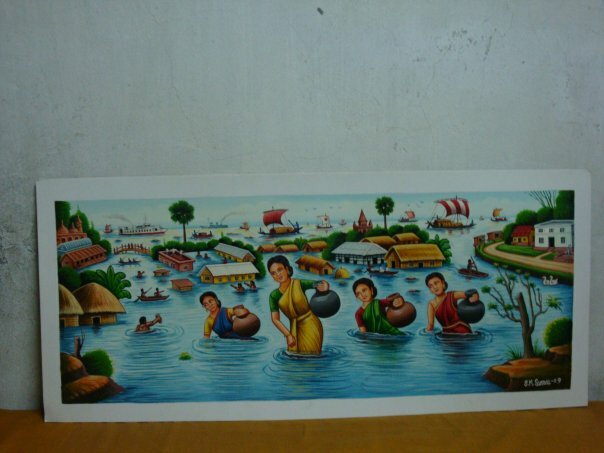 It is very important that the artist has been greatly influenced by rickshaw painting. 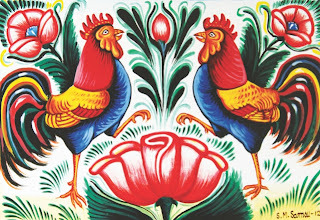 Rickshaw painting is one of the indigenous forms of art that is unique to this region. His lines are influenced by folk culture, but he has a distinct style of his own unlike other traditional craftsman. 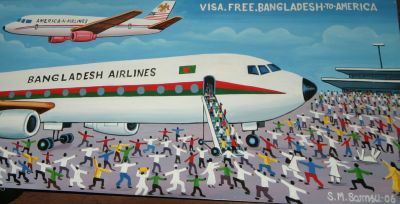 Sohel's subjects range from movie stars to depictions of village life and colourful cityscapes to pictorial interpretations of social issues to flora, fauna and animals. 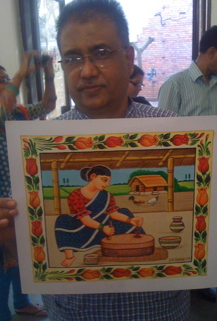 Sohel has a fondness for making masks and he has tried to make a personal hallmark through the genre of art practice. Masks have been used since ancient times for both ritualistic and everyday purposes. A mask reveals many aspects of a society. The masks at the exhibition have been fashioned only out of wood. The styles are primitive, tribal, modern, ancient African, Asiatic and at times, unfamiliar. They are not identical and each expresses a unique look. The masks on display express longing, bliss, woes and jubilation. The exhibition ends on October 10.